Read the final report on the Brooklyn Task Force's work! 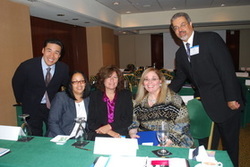 (Left) The Kings County, New York Task Force Meeting for the first time at the Initial Training Conference in Washington, DC. The Kings County/Brooklyn, New York Task Force (BTF) focused its efforts on youth in the criminal justice system, recognizing this as a pressing issue for the courts and community as people of color are unfortunately over-represented in the New York City criminal justice system. In 2012, almost 85% of the 90,000 people arrested in Brooklyn were Black or Hispanic, and 15% (13,500) were youth under the age of 20 (CJA Annual Report). The one year re-arrest rate for these youth is 41%. 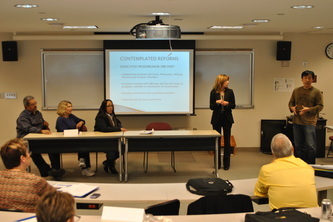 The Task Force recognized that a reform to any part of the system would have a positive racial impact. The Task Force developed a pilot project targeting 16 and 17 year-old youth arrested on minor misdemeanor charges and arraigned in adult criminal court, a disproportionately large percentage of whom are youth of color. The project offered eligible youth adolescent-appropriate services and, in exchange for their participation, the court dismissed their cases upon program completion. Defendants’ compliance was monitored by the Department of Probation. The initiative was modeled on the current practice of Adjustment in Family Court for juvenile offenders. The goal of the project was to have a constructive impact on the youth’s view of his or her future at a critical juncture in his or her life. The project’s experience will inform a broader state-wide effort aimed at rethinking the way our criminal justice system treats 16 and 17 year-olds. For more information, please click here. Concurrently, the Task Force partnered with the New York State Judicial Institute, the Administrative Judge of New York City Criminal Court and the Chief Clerk of New York City Criminal Court to design and implement a judicial training program for New York City Criminal Court Judges. Two trainings were organized: the first focused on raising awareness of cultural and implicit bias issues that impact decision-making; the second provided insight into the latest research on adolescent brain development and its implications in the criminal justice system. 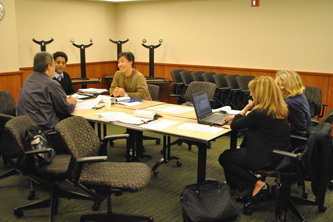 The format of the trainings included the solicitation of feedback and participation by the judges attending and was designed to gauge specific reactions to scenarios. 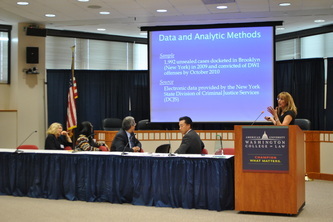 The programs were well-received by the judges and more than 85% of New York City Criminal Court judges attended. In 2014, the Kings County Task Force expanded its membership to include the Mayor’s Office for Criminal Justice, the New York City Police Department (NYPD) and the Legal Aid Society (LAS). The Task Force is comprised of senior-level representatives from each of the stakeholder agencies, making the Task Force an effective forum for identifying and addressing both day-to-day issues and more ambitious reforms. The expanded membership is listed below. Members also bring in other agency personnel to participate in working groups addressing specific implementation issues. In addition, the Task Force is collaborating with the Department of Education, the Center for Court Innovation, and Young New Yorkers to design and implement appropriate programs for DAT-Y participants. To view a list of the members, please click here. Decreasing the time between arrest and first appearance on the DAT. Creating a Youth DAT part for all 16 and 17 year-olds with DATs. Increasing the programs offered to the young people to include educational counseling as well as several restorative justice programs. Instituting a screening mechanism at arraignment to direct the youth to the most appropriate program. In the Summer 2014 DAT-Y program, which has been expanded borough-wide, all eligible youth with DATs issued between July 7, 2014 and August 31, 2014 will be included. Implementation during this trial period and the re-arrest results that are obtained will inform a permanent program in Brooklyn and, if successful, expansion to all five counties in New York City. To continue the judicial training program and the cultural competency training, the BTF is also planning to offer implicit bias and adolescent behavior training to Brooklyn Supreme Court justices. This training will be modeled on the successful programs delivered to criminal court judges in the last grant period. As with the previous pilot projects, the BTF will monitor re-arrest rates among the participants and a comparison group. The BTF is working with the Center for Court Innovation and the NYS Department of Criminal Justice Statistics to implement a suitable evaluation plan. All 16 and 17 year old clients with arrests for Theft of Services (turnstile jumping) and Marijuana Possession between the dates of 16 October 2012 and 27 November 2013 were invited to participate in the BDS pilot program. Twenty-five youth were found eligible for the program and all chose to participate. Of those, twenty- three attended the workshop/seminar. The comparison group included 28, 16 and 17 year olds who were arraigned for the same offenses between 18 December 2012 and 29 January 2013. A member of the BDS tracked the participants’ criminal justice activity through the New York Criminal Records Information Management System (CRIMS) database on a monthly basis for five months post-program. While a recurrence of the charging offense was noted, particular attention was paid to the commission of higher-level offenses. Recidivism data from the CRIMS database were recorded in an excel database that included the names of the individuals who completed the program along with a comparison sample of 28 who did not participate in the program, but were charged with marijuana use and theft of transit service (turnstile jumping). Each member of these two samples was tracked monthly for subsequent arrests for five months post-program. The re-arrest rate among participants is less than half of the re-arrest rate among a comparison group. Of the 25 participants who completed the diversion program, two did not appear at final disposition, thus did not have their charges dismissed. Additionally, over the next five months, three were subsequently arrested for additional offenses, in comparison to six arrests for the comparison group. In sum, of the DAT-Y group, 12% of participants were subsequently charged with new offenses. Of the comparison group, 21.5% were charged with new offenses. The DAT-Y project has substantial support from the criminal justice system in Brooklyn already. If the results achieved to date are sustained over a longer time period and in a larger sample, the project will have demonstrated an effective way to decrease re-arrest rates that is low-cost and of high benefit to at-risk youth. BTF members and their agencies are working together to develop a rigorous monitoring and evaluation plan to obtain measurable results for this purpose. At the same time, BTF members have begun to disseminate information about the DAT-Y program in the broader Brooklyn community. The success of the pilot DAT-Y program has garnered media interest and inquiries from other jurisdictions interested in replicating the program. If the project is expanded to all five New York City counties as is projected, it is anticipated that there will be more media interest, which informs and educates the criminal justice community and the public. The Judicial Training activities in Brooklyn Criminal court have been well-received, with the result that the Supreme Court judges have expressed interest in a similar program and cultural competency training is planned for the Fall 2014. In the long term, the BTF would like to extend these training programs to the defense attorneys and prosecutors practicing in the court. A continued reduction in recidivism rates for the participating DAT-Y youths and creation of a permanent borough-wide program would be a success, as would expansion of the program city-wide. Periodic judicial training on cultural competency and implicit bias would also be a successful innovation. Expanding opportunities for DAT-Y eligible youths to access a wide array of educational options and program services is also an important component in the success of the program, as is ensuring fair procedural justice in Criminal Court. The BTF is taking a deliberately cautious path to expanding the DAT-Y program so that the final model is easily replicable. By launching repeated iterations of the pilot, BTF members identify and address issues that arise in implementation. We are also aware of the various logistical and budgetary issues that will develop as the program expands. In bringing in senior staff from the Mayor’s Office, NYPD and the Legal Aid Society, the BTF now incorporates all the key agencies in the criminal justice system in Brooklyn, and has a significantly greater city-wide presence. BTF members are thus well-placed to oversee the development of appropriate and sustainable in-house procedures for the implementation of the DAT-Y project. As the DAT-Y project moves beyond the parameters of the BTF, members are focusing on other issues in the criminal justice system for their next project. Project update! 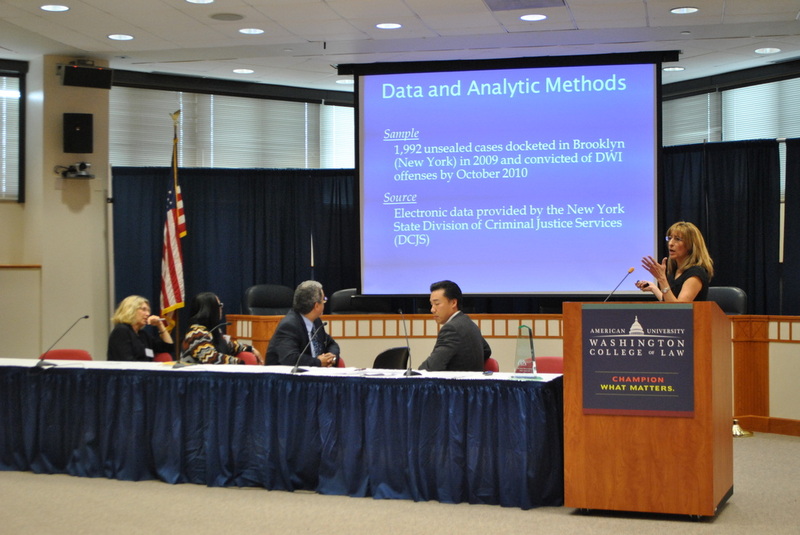 On April 2014, The Brooklyn Task Force held a training regarding adolescent behavior and implicit bias for all Kings County Judges. The task force is planing another training and currently discussing the expansion of their current juvenile program. Project Update! With funds provided by the Public Welfare Foundation, the Brooklyn Task Force will be sustaining their great work by initiating another round of juvenile diversion efforts. The first scheduled adjourn date was November 2013, with an additional adjourn date on December 2013. Congratulations to Brooklyn for their continued commitment. To learn more about this project click here. Project Update! The BTF met on December 2014 to discuss progress on the 2014 iteration of the diversion program. The Center for Court Innovation (CCI), who will be evaluating the program, expects to present the three-month results on re-arrest/conviction sometime in Feb/March (the 3 month anniversary of the program is on Dec 31). Assuming the BTF will continue to see good results, the task force hopes to immediately start institutionalizing the program in Brooklyn. At the same time, the BTF plans to take on another project in 2015 concerning the considerable number of outstanding summons and DAT warrants. Further discussions about this new project will continue when the BTF meets again in Jan/Feb. The first DAT-Y pilot limited eligibility to 16 and 17 year-old defendants with DATs charged with B misdemeanor marijuana possession (221.10) and A misdemeanor theft of services (165.15) only. In the second iteration, we increased the range of charges to include all non-violent DATs. Intake for both iterations was done at a regular DAT arraignment part and was a Brooklyn-wide program. Neither NYPD nor LAS was involved in the first two iterations. 16 and 17 year-old clients were identified at arraignment, screened by DOP, and recommended (or not recommended) for the program by BDS, KCDA, and the Court. BDS staffs one such part a week, so intake was limited to one day per week over the duration of the pilot. Since all the program participants were BDS clients, BDS was able to follow their NYSIDs in CRIMS, even after their cases were dismissed. A comparison group was created by following all the 16 and 17 year-olds who came though BDS-staffed DAT arraignment shifts in the period directly before or after the DAT-Y program. To measure the effectiveness of the program, the BTF has compared (a) the number of kids who have been re-arrested among a comparison group of 16 and 17 year-olds who come through DAT arraignments with (b) the number of kids who are re-arrested among the cohort that is offered the DAT-Y program. So, is the DAT-Y program effective at reducing re-arrests? The answer seems to be yes. In both iterations of the pilot, the re-arrest rate among all youth where the DAT-Y program was offered was less than half of the re-arrest rate among all youth with DATs, regardless of whether or not the youth participated in the program or completed it successfully. Eligibility Criteria: 16 and 17 years old at arrest; issued DATs and showed up at DAT arraignment; 221.10 and 165.15 charges only. Program Participants: 6 DAT shifts from Oct 16 – Nov 27, 2012. 25 youth were eligible, all were screened for the program by DOP, and all were recommended for the program. 22 youth successfully completed the program and had their cases dismissed and sealed. Program: A three-hour session beginning with a presentation from DOE, followed by a “decision-making skills” workshop led by CCI. Comparison Group: 6 DAT shifts from Dec 18 2012 – Jan 13 2013. 28 youth met the eligibility criteria. (All their cases were disposed at arraignment: 22 ACDs; 6 Pleas). DAT-Y I Intake: 4 of the 25 youth were rearrested at least once within the year following their participation in the program (16% re-arrest rate). Comparison Group: 10 of the 28 youth were rearrested within the year following their DAT arraignment (36% re-arrest rate). Eligibility Criteria: 16 and 17 years old at arrest; issued DATs and showed up at DAT arraignment; any non-violent charge. Program Participants: 7 DAT shifts from Oct 3 – Nov 21, 2013. 32 youth were screened for the program by DOP, 29 were found eligible and participated in the program. (3 had new open cases which made them ineligible). All 29 had their cases dismissed and sealed. Program: A three-hour arts-based restorative justice workshop led by YNY. Comparison Group: 7 DAT shifts from Aug 7 – Sept 19 2013. 35 youth met the eligibility criteria. (All their cases were disposed at arraignment: 31 ACDs; 2 DISM; 2 Pleas). DAT-Y II Intake: 5 of the 32 youth were rearrested at least once within the 11 months following their participation in the program (16% re-arrest rate). Of the 29 participants in the program, only 3 have been re-arrested. Comparison Group: 12 of the 35 youth were rearrested in the year following their DAT arraignment (34% re-arrest rate). What's Happening in Brooklyn! 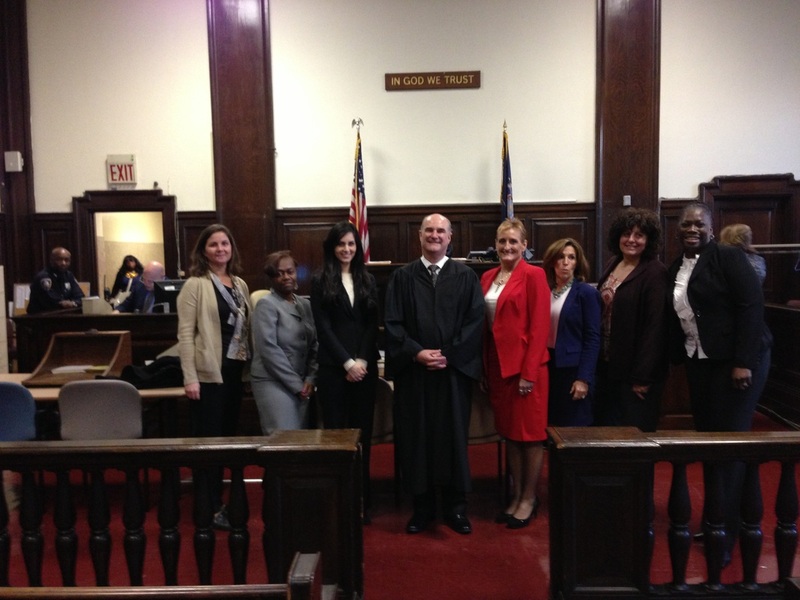 The Kings County New York Task Force welcomes Honorable George Grasso, of the Criminal Court of the City of New York, Kings County, as the newest member of the team. Judge Grasso was a former member of the New York Police Department, and was the former First Deputy Police Commissioner. 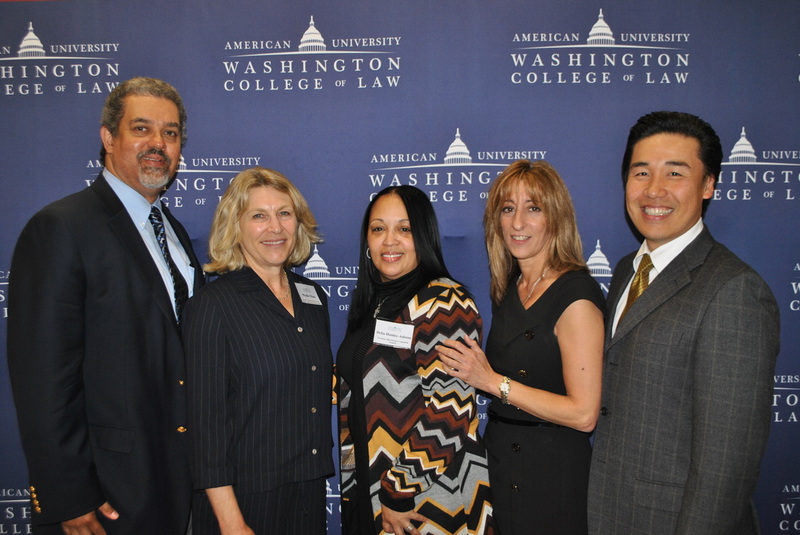 Lance Ogiste, the Task Force's prosecution representative, was recently awarded the Thomas E. Dewey Medal, an award presented every year to an outstanding prosecutor in the office of each of the five District Attorneys. On October 10, 2014, RJIP held their annual meeting to discuss where we are and our future plans for reform. Judge Grasso presented on behalf of the Brooklyn Task Force, discussing the biased free training of judges in New York that the Task Force plans to implement. To view the presentation, please click here. Congratulations Lisa Schreibersdorf! Lisa Schreibersdorf, Executive Director of Brooklyn Defender Services and member of the Kings County Brooklyn Task Force, received the Judith Kaye Public Service Award on behalf of the Women’s Bar Association of the State of New York on June 6, 2013. The New York City Council has approved a measure to allow citizens to sue the New York Police Department in state court not only for individual instance of racial discrimination but also to challenge police practices that disproportionately affect people of color without serving any significant law enforcement goal. The bill, known as the Community Safety Act, passed by a veto-proof majority—vital because Mayor Michael Bloomberg has promised to veto the measure. The bill also expands the definition of bias-based profiling to include age, gender, housing status, and sexual orientation. The Criminal Justice Response to 16- and 17-Year-Old Defendants in New York, a new study from researchers at the Center for Court Innovation, documents how the justice system handles 16- and 17-year-old defendants across New York State. The report also examines the Adolescent Diversion Program, an initiative launched by New York State Chief Judge Jonathan Lippman to improve outcomes for this population. To read the full report, please click here. Center for Court Innovation, 2014.